Posted by Matt Fleming, PsyD in Uncategorized. The video is about 2.5 min long. Learn more about the idea on the actual Kickstarter project page. Here is a 5-min clip I edited (with beats added) of a 20-minute 2009 TED talk: Elizabeth Gilbert on Nurturing Creativity. I was so inspired and moved to tears by her talk. I distilled it to five minutes because not everyone can or is willing to watch all 20 minutes, though it is worth it. After years of waiting, Monster Pong is finally for sale! There are only limited sets at the moment (about 300) so if you are thinking about it, you may want to order yours before they sell out (www.MonsterPong.com). Big thanks to the folks over at Everyday Edisons for bringing my idea to life! I can finally start a new category here at SparkBugg: “Invention!” Instead of an IdeaSpark* (which is just my fancy name for an idea), an Invention is one of my ideas/designs that actually gets produced. So here it is, finally on web shelves for purchase: The Cloak. Below is a review by Metagamers. Here is my latest idea pitch over at Quirky.com. On Quirky, Bill’s idea for a dustpan with grooming teeth was chosen. You can find out more about it here. Below was my industrial design pitch. Below is an older clip of mine: another Quirky.com design submission. Fred suggested Quirky make a spatula with detachable heads. You can see their final product here. But below was my industrial design submission. Genius concept. 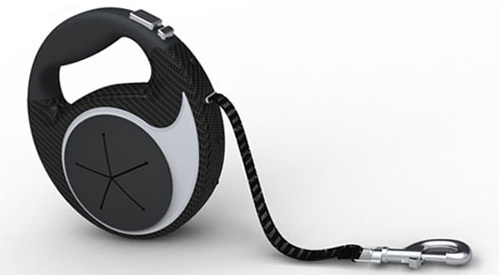 The leash retracts and recharges a built-in LED light, which is crucial for finding dog poop in the dark. I love it. Too bad it is not yet in production. Via OhGizmo! I glued a flashlight to my dog leash, but it fell off a week ago, so I am looking for Barkley and Baxter’s crap with my IPhone flashlight app for the time being. Annoying. I designed this gadget to help manage your earphone/earbud cord. You can watch my original design pitch below (which is a different clip from the original idea pitch in post 579). The design team over at Quirky tweaked the final version, which you can see below. You can pre-order the Wrapster for $6.50 HERE. Someone at Quirky.com thought they should produce an IPad case. I pitched my design below (and it was chosen to be incorporated into the case’s development!). It is now going into production. Check it out HERE. I decided to go for it and submit an idea to Quirky.com to see if the sucker can be voted into production. It’s a gadget to prevent my #3 pet peeve: tangled earphone cords. If you want to consider voting for it or other ideas at Quirky, feel free to visit the Quirky.com (it’s on page 2, under “Product 30”). Registration to vote is quick and easy, and voting for this round will end around Monday morning (Feb 1st). Thanks! Some of you may recall that I was one of the 12 inventors featured on PBS’s Everyday Edisons. Well, if you hadn’t seen the show, it is now on Hulu.com. Check out the promo below to see if this show is up your alley. And if so, go to HULU.com to check any or all of the 13 episodes, for freezy. The idea, by Judi Sigler, is for a better way to stir your coffee or tea at the office. She submitted it to be voted at Quirky. If it wins, the invention will be produced. I voted for her! You can join Quirky.com to vote for her ideas, or many others. UPDATE: Judi’s idea won and is now available for preorder! Read more about it HERE. Thanks to the book Crush It! , I am seriously considering kicking SparkBugg back up again, with more of a focus on my own video clips of ideas and reviews. Last night I worked on a video after being inspired by an idea at Quirky.com (a crowdsourcing invention house). Check out the 30-second video about Quirky below. my daughter, and best (co)invention ever…. Erin, Matt’s wife here…..I’m excited to report that Everyday Edisons Season 2 premieres today on several PBS affiliates. You can check out the EE website which features Season 2 inventors here (Matt is on the right, in the green shirt). Sadly, we won’t be able to see it today as our DC PBS station isn’t airing it in June or July (for your location and times, go here). It’s been an exciting ride over the past 18 months being part of the show and we are thrilled that viewers will be able to see the journey! Posted by Matt Fleming, PsyD in Product, Video. I just got this fun fidget toy in the mail last week. I haven’t figured out the fancy maneuvers like those in the clip below, but it is still whimsically playful, for about $35. I love it. Their website HERE; buy it HERE. Posted by Matt Fleming, PsyD in Product, Transportation. I was wondering when someone would produce this: a scooter that also has a kick pedal so you can continue to propel yourself without touching the ground. I may buy one soon, for $120. Below is a quick clip of this product in action. Their website HERE; Via BornRich. Here is a Bright Idea…try to see if this blog can help with an important cause. A dear friend of mine has multiple sclerosis, and I will be joining her and her team for the MS walk this April 5th. I have pledged $100 to the cause. If you would like to contribute as well, or just learn more about MS, please click HERE. This smart clock requires you to be more alert in order to turn it off, and will exercise your brain in the process. Well done, via Make. Posted by Matt Fleming, PsyD in Furniture, Game, Product. I don’t know about you folks, but my wife and I use our dining table about 3 times a year, when we get around to having a dinner party. Otherwise, we eat on our kitchenette every night. So that is why I think this dining table, which converts into a pool table, is a Bright Idea. Finally use your dining room more frequently. Add a ping-pong tabletop addition, and you will use that room even more. Check all the versions out HERE; via BornRich. Posted by Matt Fleming, PsyD in Product. This 32 oz spray bottle holds a roll of paper towels. Quite convenient to use, but maybe not so to transfer the cleaning solution from the original bottle. For $10, buy it HERE. Watch the 30-sec cheesy infomercial below. Posted by Matt Fleming, PsyD in Art, Video. This digital sculpture is found in Heathrow Airport, and is made out of about 5,000 individually-controlled (via computer) flip-dots. Designed by Troika. Check out the clip below (via Make). 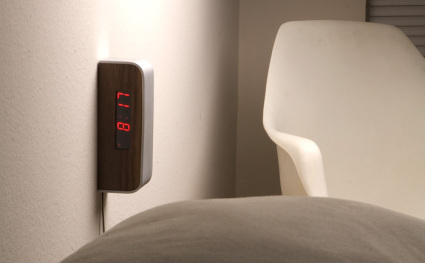 No need to lift your head off of the pillow to read this clock. Though it is not yet in production, I would instantly purchase one if (A) I didn’t have to put on glasses to see the clock anyway; (B) I allowed electric clocks near my bed (yup, it’s my EMR concerns again). Via Inventorspot. Posted by Matt Fleming, PsyD in Baby, Product. This rinse cup has a soft flexible yellow panel to conform to your child’s head. Keep that soapy water out of your little boo-boo’s eyes. Buy it HERE ($9). Posted by Matt Fleming, PsyD in Art, Product. Artistic, practical, versatile, and outrageously priced (at $319; buy it here). By Frederik Roije; Via BLTD. Posted by Matt Fleming, PsyD in IdeaSpark*, Product. This bathtub is designed to support your knees and conserve water. I like the idea, but I wonder about two possible problems: (1) if two people are in the tub facing each other, it could get awkward getting both sets of legs comfortable; (2) I like to occasionally slide my body down to submerge my entire head, and with this tub I can’t. IdeaSpark*: a proposed solution addressing both problems: Manufacture just the peak (a large triangular wedge) out of a material that won’t float. Make different sizes, then anyone can buy one to use in their regular tub. Slide it down to submerge your head; remove it to make room for your partner. Bonus: way less expensive. Designed by Lyndon Craig (here); via ApartmentTherapy. Posted by Matt Fleming, PsyD in HumBugg, Product. My in-laws have birds residing in their chimney, so they never use their fireplace. So as a holiday gift, I purchased for them Brookstone’s Fireplace DVD: 50 minutes of high-definition film of a crackling fire (with or without holiday music). Instantly my father-in-law realized that there was a problem: like with most plasma TV screens, a constant image will burn pixels after about 30 minutes. On the DVD, the fire itself moves, of course, but the rest of the image was static. I guess I didn’t find the fine print that indicated that this DVD was only for LCD and old-school TVs. Since it was a Christmas gift, this was truly a bah HumBugg. Posted by Matt Fleming, PsyD in IdeaSpark*. I recently saw this Omni-directional suitcase (it has 4 casters) by Brookstone at an airport ($69, here). It glides effortlessly, so I thought it would be cool to add a little attachment and area for my foot so I could use the entire thing as a scooter. There are long distances to walk in airports, and the floors are always oh-so smooth. Why not glide scooter-like through the concourses? At least until the airports ban this idea. Meanwhile, I find the typical handle on these rolling suitcases awkward, forcing my forearm to twist as if I am about to do a bicep curl. IdeaSpark*: Why not add a simple flip-out attachment (like with swiss army knives) so the additional handle is parallel to my direction of movement, as If I was carrying a briefcase. There could be one of these handles on each side, so I could choose the one closest to me depending on which side of my body I am rolling the suitcase. Sure, they make attachments you can purchase (like this one), but the luggage companies should simply integrate this idea into the existing handle. Posted by Matt Fleming, PsyD in Computer, Product. Anything that keeps the heat and EM radiation of a laptop away from my gonads is a Bright Idea. This carry-on bag has an integrated table, where the ubiquitous handle extension used when rolling ingeniously doubles as the legs of the table. And the whole thing is affordable ($129; buy it Here). Sparkbugg.com is a blog about sharing smart ideas, inventions, and innovation.